One thing that’s worth considering when you visit Cairns for a birding trip is to do an ‘add-on’. One such add-on is heading north up Cape York to places such as the Iron Range. Another is to head to the southern sections of Cape York. Aside from Mt Isa, the major birding locations to visit are Cumberland Dam and, then moving west, Karumba. This report covers these two fantastic birding spot. The trip takes you through Australia’s Gulf Savannah, an habitat type that occupies about a quarter of the continent, around 2 million square kilometres! 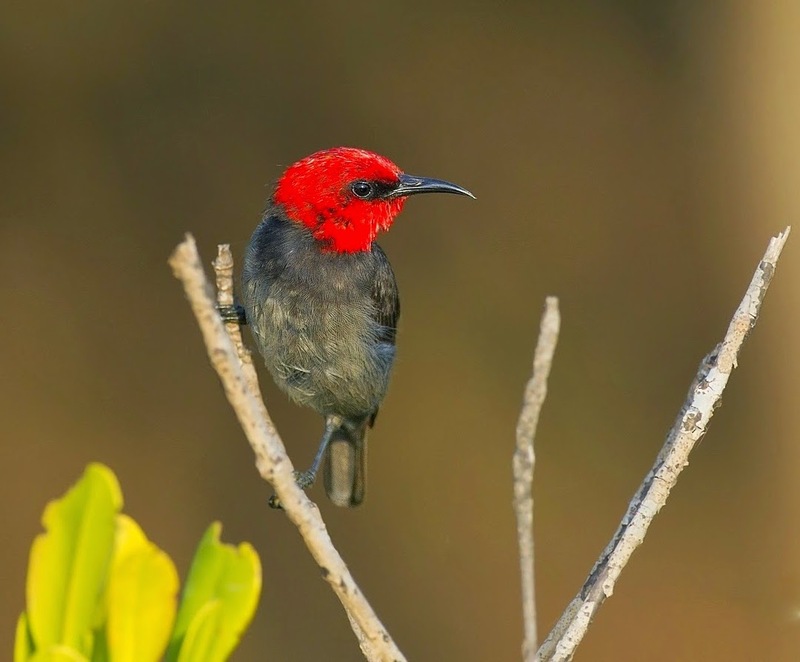 Red-headed Honeyeater, just one of the special birds of Karumba’s mangroves. (Image Geoff Jones.See Geoff’s fantastic new photographic field guide Birds of Australia). The benefits of visiting Cumberland Dam and Karumba – apart from seeing some fantastic Australian landscapes – is that you get see a wide range birds not generally found around Cairns. To give you a taste of what I mean, at these two sites you may see Black-breasted Buzzard, Sarus Crane (if you’ve missed seeing them already on the Atherton Tableland), White-breasted and Mangrove Golden Whistler, Zitting Cisticola, Yellow White-eye, Red-headed, Rufous-throated, Banded and Yellow-tinted Honeyeater, Arafura and Mangrove Grey Fantail and Red-browed Pardalote. Not bad! And for those of us who like seeing finches, there’s finches in abundance: you might see Star, Black-throated, Masked. Plum-headed, Zebra and Double-barred Finch and there’s also a chance of seeing Pictorella Mannikin and (with a big stroke of luck) Gouldian Finch. Driving west along the Gulf Development Road, the distance to Cumberland Dam from the Atherton Tableland is approximately 300 km. From Cumberland Dam it’s another 350 km to Karumba. So a round trip from the Cairns adds about 1300 km to any trip, so you’d need to allow for about 4-6 additional days. However, if you have time, believe me it is well worth the effort! The Gulf Development Road is part of the ‘Savannah Way’ – its full length is 3700 km, from Cairns to Broome. While driving the Gulf Developmental Road look for signs of birdlife anywhere along the roadside. Look out for Ground Cuckoo-shrike; when I did this trip I saw them at a number of locations. There’s a chance of seeing Little Woodswallow, particularly in rocky areas. Stop along any creek line and search for Black Bittern, the best time to see them tends to be late spring. Along the creek look in the larger smooth bark eucalypts for Red-browed Pardalote. In the grassy woodlands between Mt Surprise and Georgetown looks for Red-backed, Forest and Sacred Kingfisher, Ground Cuckoo-shrike, Little and Red-chested (uncommon) Button-quail, White-throated Gerygone, and there’s the potential see five species of Woodswallow – as mentioned Little, but also White-breasted, White-browed, Masked and Black-faced. 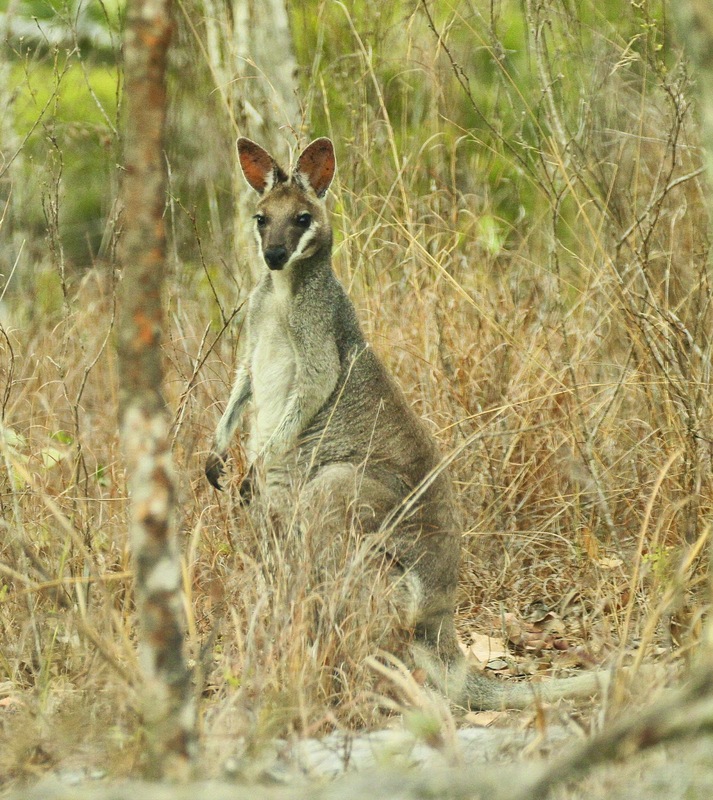 You should see quite a few kangaroo along the way, such as Eastern Grey Kangaroo, Common Wallaroo (Euro), Agile Wallaby, Whiptail (Pretty-faced) Wallaby, Northern Nailtail Wallaby and Rufous Bettong – particularly if you’re traveling at night. Unfortunately many end up as road-kill, so be careful! This attracts the larger raptors such as Wedge-tailed Eagle, Spotted Harrier, and Black and Whistling Kite. You’re also likely to see Black-breasted Buzzard – one of the main highlights for the trip – we saw a pair approximately 20 km west of Mt Surprise. As a one day detour, just before you get to Mt Surprise, you pass by Undara Volcanic National Park and the spectacular Undara Lava Tubes. These are amongst the largest and longest lava tubes on the planet. It’s not the greatest bird site, but if you do head in, it’s a pretty good for dry country woodland birds such as Squatter Pigeon, Pale-headed Rosella, Red-tailed Black-Cockatoo, Red-winged Parrot, Peaceful and Diamond Dove, White-browed and Masked Woodswallow, Rainbow Bee-eater, and Australian Bustard. Black Bittern are occasionally seen i.e. on the Swamp Walking Track, and it can be quite good for swifts such as Fork-tailed Swift and White-throated Neddletail. Red Goshawk has also been recorded there, so keep your eyes peeled. Generally speaking Undara Volcanic National Park is actually a better spot to see mammals than birds. For instance, it may have the highest diversity of macropods/kangaroo in Australia! Look out for Eastern Grey Kangaroo, Whiptail (Pretty-faced) Wallaby, Antilopine and Common Wallaroo, Black (Swamp) Wallaby, Mareeba Rock Wallaby (common at the lava tubes), and Rufous Bettong (common around the lodge at night) and there are records of Spectacle Hare-wallaby, Black-striped and Allied Rock Wallby. That’s not a bad list. White Water Lily at Cumberland Dam. When I visited Cumberland Dam with Greg Oakley a few years ago, we deliberately timed our trip to coincide with the end of the dry season and the beginning of spring. 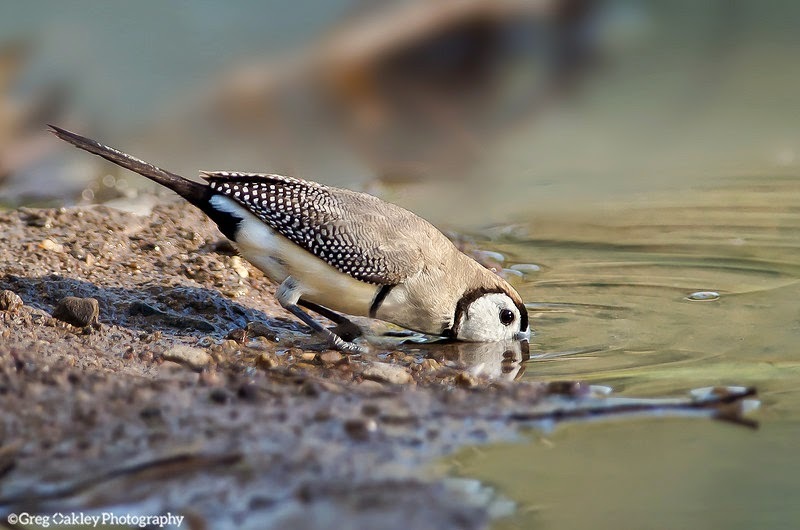 This is the perfect time to visit – much of the water on the Cape has dried up, so it gave us the best shot for seeing birds coming in to drink at the dam. At this time of year, therefore the dam is an oasis in a vast arid landscape. Part of the reason Cumberland Dam is so good is because of its fantastic geographic location. It’s located in a transition zone for many species at the very limit of their normal range. For instance the dam is (basically) the northern limit for Plum-headed Finch, the eastern limit for Pictorella Mannikin, Gouldian Finch, Yellow-tinted Honeyeater, Varied Lorikeet and Spinifex Pigeon, the western limit of Squatter Pigeon, and the southern limit of Masked Finch. It’s also pretty much the dividing line between the distribution of Paperbark Flycatcher (to the west) and Restless Flycatcher (to the east). The birds at Cumberland Dam tend to be Paperback Flycatcher, although you do also get Restless Flycatcher. So this is one of the only places in Australia where you potentially get both species side by side. Paperback Flycatcher are slightly smaller than Restless Flycatcher, and listen for the Paperback Flycatcher’s distinctive musical toowee call. In line with being different species, Paperbark and Restless Flycatcher don’t interbreed. Also most of Cape York subspecies start their general distribution around Cumberland Dam, such as the Brown Treecreeper (‘Black Treecreeper’ melanota ssp), Pale-headed Rosella (‘Blue-cheeked Rosella’ adscitus ssp) and Red-browed Pardalote (yorki ssp), Black-throated Finch (black-rumped atropygialas ssp) and Masked Finch (‘White-eared Finch’ leucotis ssp). Note that there’s no facilities at Cumberland Dam. There’s bush camping only, however there is accommodation at Georgetown, such as the such as Midway Caravan Park. Smaller trees include Gutta-percha (Excoecaria parvifolia), Soapbush Wattle (Acacia holosericea), Lancewood (A. shirleyi), Whitewood (Atalaya hemiglauca), Cochlospermum (Cochlospermum gillivraei), Red Ironwood (Erythrophleum chlorostachys), Sandpaper Fig (Ficus opposita), Gardenia (Gardenia vilhelmii), Darwin Silky Oak (Grevillea pteridifolia), Quinine Bush (Petalostigma banksii) and Wild Plum (Terminalia platyphylla), and there’s a nice range of Melaleuca including Silver-crowned Paperbark (Melaleuca fluviatilis), Silver Cadjeput (M. argentea) and Broad-leaved Paperbark (M. viridiflora). In the morning I awoke in my tent to a fantastic dawn chorus. 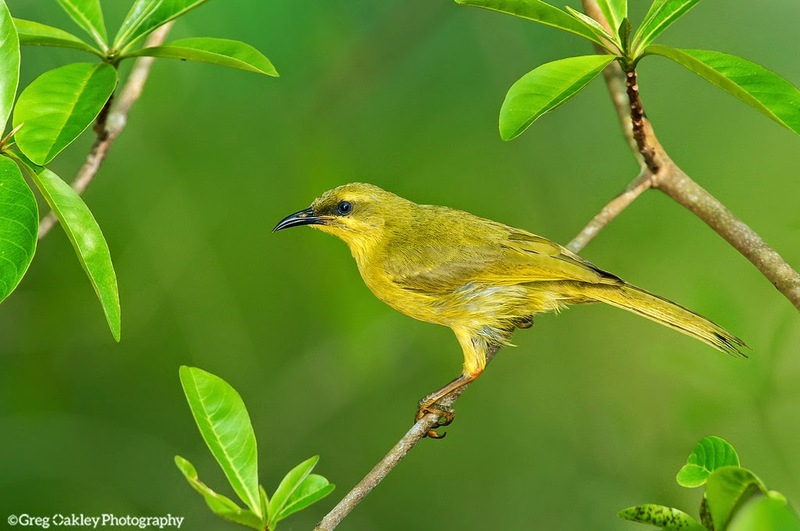 The most vocal birds being the honeyeaters, including Yellow-tinted, Rufous-throated, Brown, Yellow, Banded, and Blue-faced Honeyeater, as well as Yellow-throated Miner, and Noisy and Little Friarbird. Fantastic. The first bird seen after getting out of my tent was Rufous-throated Honeyeater, which turned out to be the most common bird there. Nearby a Pied Butcherbird sung its wonderful piping call – my all-time favourite bird call – while a happy family of Grey-crowned Babbler claimed several trees as their own. And there was a very large Great Bowerbird’s bower directly opposite our bush camping area (-18.30178,143.350788). Squatter Pigeon at Cumberland Dam. All up we spent several days at Cumberland Dam, once on the way through to Karumba, and once on the way back to Cairns. In terms of seeing finches, we found that the most productive dam – in terms of birds coming in for their morning drink – was not the main dam but the smaller dam immediately to the west (-18.29905,143.349211) – sometimes called West Cumberland Dam. At this dam several mid-sized shrubs acted as a protective vantage point for the finches and honeyeaters to roost upon just before coming down to drink. The finches would land on the ground on the north-east side of the dam, feed on grass seeds, then fly to the shrubs in preparation for drinking. 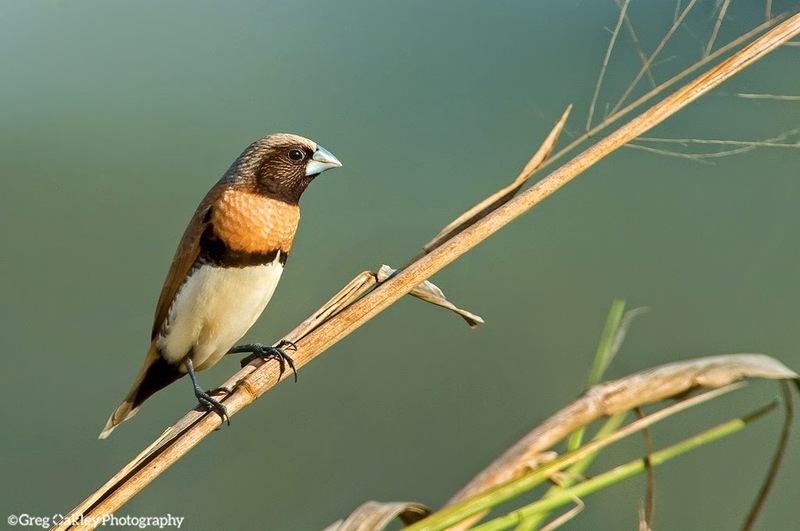 At one point we had six species of finch roosting in these over-hanging shrubs – Zebra, Double-barred, Black-throated, Masked and Plum-headed Finch and Chestnut-breasted Mannikin! Does it get any better than that! Well possibly! Greg and I had our fingers crossed in the hope of seeing Gouldian Finch or Pictorella Mannikin. Unfortunately, on this trip, it was not to be. In terms of Gouldian Finch, there had actually been no sightings on Cape York for several years. During surveys conducted by Cairns Naturalists Club, they reported Gouldian Finch at the dam every year between 1974 and 1997. As far as I know, unfortunately they haven’t been seen since. 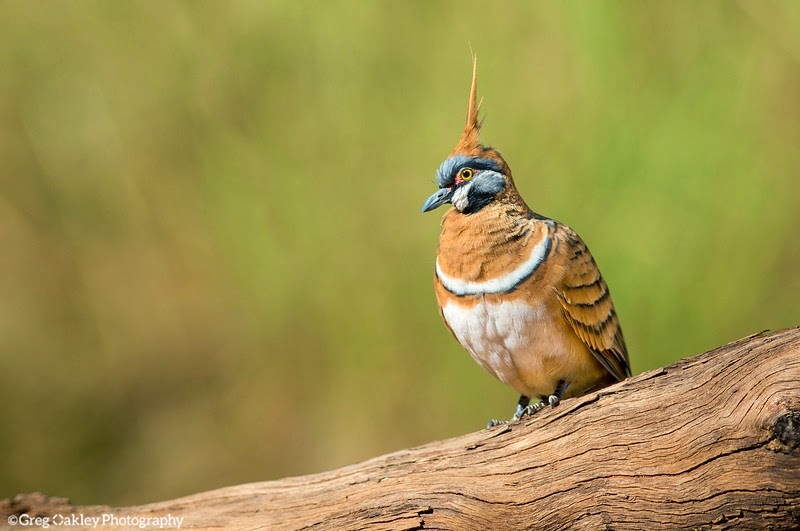 Similarly Spinifex Pigeon was once quite regularly, however there are now very few records. In terms of waterbirds, the larger dam is the place to be. At this dam there were Green Pygmy-Geese, Magpie Geese, Hardhead, Grey Teal, Pink-eared, Pacific Black and Australian Wood Duck, Intermediate and Great Egret, White-faced and White-necked Heron, Australasian Grebe, Little Black and Little Pied Cormorant, Australasian Darter, Australian Pelican, Black-winged Stilt, Red-kneed and Black-fronted Dotterel (there’s at least one at every dam or waterhole in the outback) and Comb-crested Jacana. Now that’s a pretty good list of waterbirds. Interestingly Comb-crested Jacana seems to turn up wherever there’s a spare lily pad, even if the lily pad is located in a dam in the middle of no-where and the dam’s only the size a tennis court. Although we didn’t see any, other waterbirds recorded at Cumberland Dam include Cotton Pygmy-Goose, Freckled Duck, Black Bittern and Australian Painted Snipe, so keep your eyes open. In summer, there’s a good chance of seeing migratory waders such as Sharp-tailed and Marsh Sandpiper, Common Greenshank and Latham’s Snipe. 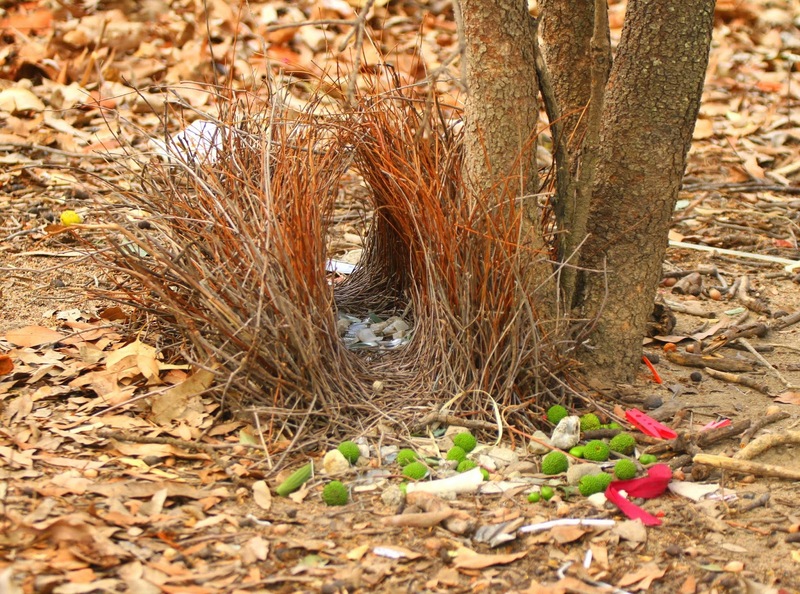 A Great Bowerbird’s bower. There are several bower around Cumberland Dam, including one immediately in front of our campsite. One evening a dense flock of ~200 Plumed Whistling Duck landed on the north side of the dam, and set up camp for the night. It’s a great site to see such a large flock of these birds, and to hear the combined cacophony of their twittering whistling calls. When I was a kid an alternative name for Plumed Whistling Duck was Whistling Tree-Duck, so it was nice to see some of them roosting in the trees beside the dam. Aside from the waterbirds, there was a great variety of woodland species around the dam. We found Squatter Pigeon – always a target species for Cumberland Dam – in the bush on the eastern side of the larger dam, and several came into drink at the main dam in the evening. 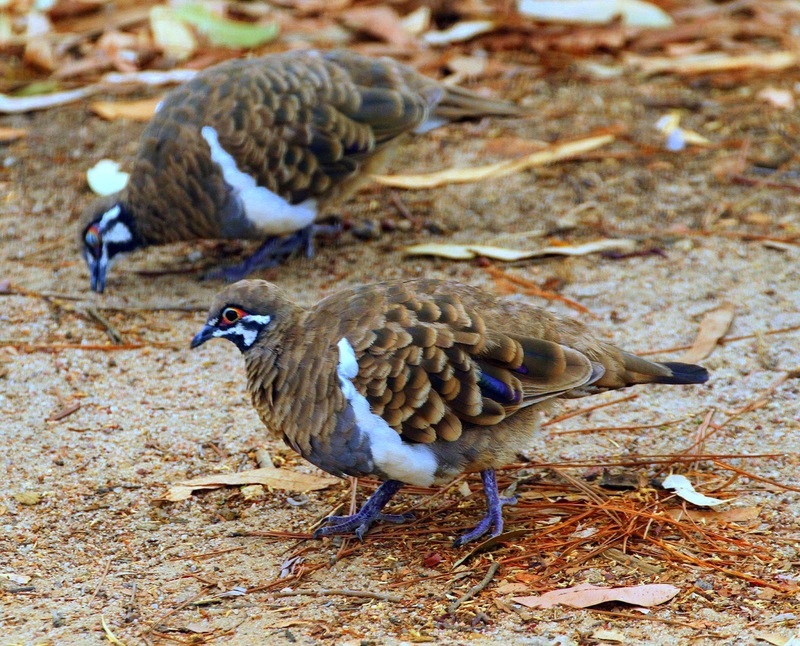 The Squatter Pigeon here have the red-eye ring of the Cape York ssp peninsulae. While other birds here included Brown Quail, Diamond and Peaceful Dove, Brown (Black) Treecreeper, Red-winged Fairy-wren, Striated Pardalote, White-throated Gerygone, Black-faced Woodswallow, Paperbark Flycatcher, Apostlebird, White-bellied Cuckoo-shrike and Australasian Bushlark. Woodland parrots around the dam included Pale-headed (Blue-cheeked) Rosella, Red-winged Parrot and Cockatiel and Budgerigar, and there was an abundance of Galah, giving a theatrical performance – as they do – each night when they came in to drink. There was a spectacular flock of Red-tailed Black-Cockatoo, flashing their dramatic red tail every time they took off or landed. Varied Lorikeet are also occasionally seen at Cumberland Dam – they have preference for flowering Bloodwood, particularly any with Mistletoe. This is the the north-east limit for this species, and they are rare here. To sum up, the birds at Cumberland Dam were simply spectacular. It was as close as you get to an Australian version of a Serengeti water hole experience – minus the Lions of course. If you’re staying around the Georgetown region for a few days, there are other spots that you should visit. These include the Georgetown Racecourse, Durham Dam, Flat Creek Station and Cobbold Gorge Nature Refuge. The Georgetown Racecourse is a another good spot for finches, most notably Pictorella Mannikin. A good spot to look is near the dam in the middle of the track (-18.299575, 143.522653), and a good time to look is mid to late afternoon, let’s say around 4:00 pm’ish. 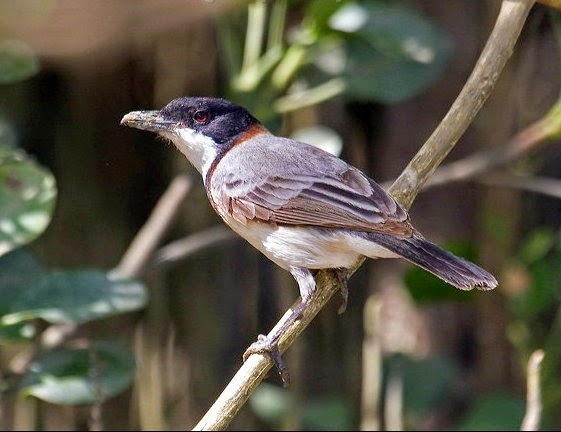 You should also see Zebra, Masked, Black-throated, Double-barred Finch and Chestnut-breasted Mannikin. Other birds to look out for include Black-breasted Buzzard, Australian Bustard, Banded Lapwing, Red-backed Kingfisher, Sqautter Pigoen, Brown Quail, Dollarbird, Red-winged Parrot, Pale-headed Rosella, Yellow and Rufous-throated Honeyeater, Australasian Bushlark, Masked, White-browned and Black-faced Woodswallow, Grey-crowned Babbler and Varied Sittella, to name a few. Another dam that’s worth visiting in the area is Durham Dam. Access is ~7 km west of Georgetown, with the located about 500 m south of the Gulf Development Road, here -18.289531, 143.478209. There is an access gate to the dam, but you can walk in. Durham Dam attracts similar birds to Cumberland Dam, and is great for finches, for instance Gouldian Finch have been previously seen here. It also has the addition of Variegated Fairy-wren, representing the very north-east range limit for this species (look near the small channel dams near the road). It’s worth trying to flush the odd Button-quail or two, with a chance of seeing Red-chested Button-quail. The dam is also a good place for seeing wild Dingo. Flat Creek Station is a large cattle grazing property approximately 50 km from Georgetown (-18.523549, 143.327751). Gouldian Finch have been recorded on the property (with a few recent sighting), and they hold an annual finch surveys. The other specialty bird for the property is Spinifex Pigeon, being one of the few places in the region where you can reliably find then. 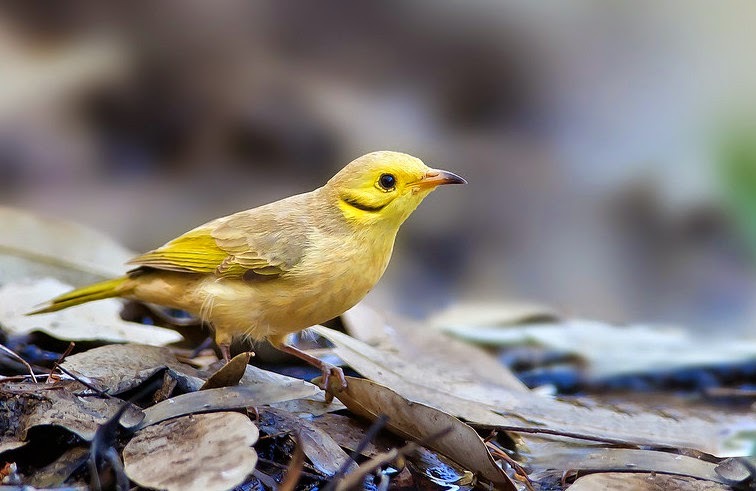 Other woodland birds include Squatter Pigeon, Pale-headed Rosella, Red-winged Parrot, Red-backed Fairy-wren, Red-browed Pardalote, Brown (Black) Treecreeper and honeyeaters such as Yellow, Yellow-tinted, Rufous-throated, Brown and Blue-faced. There’s a bird list for the Flat Creek Station available at the homestead. There’s a very pleasant camping ground (with unpowered sites) and they also have showers with hot water! Bookings are essential when visiting the station (07 40 625304), web page http://www.flatcreekstation.com.au – and they even have a Facebook page. Quite obviously, the reserve contains a spectacular 2 km long gorge along the Roberson River, with a large permanent waterhole. As you can imagine this is the perfect conditions for birdlife. As you’d expect, it’s a good place waterbird, for example Black Bittern regularly occur there. Other birds you might see include Black-breated Buzzard, Blue-winged Kookaburra, Azure Kingfisger, Squatter Pigeon, Red-winged Parrot, Pale-headed Rosella, Cockatiel, Budgerigar, Crimson Chat, Red-browed Pardolote, Brown (Black) Treecreeper, and honeyaters, such as Yellow, Yellow-tinted, Rufous-throated, White-throated, Brown and Blue-faced Honeyeater. Because it’s a wildlife corridors and catchment linkage and contains some nice riverine bushland, it acts a bit like an oasis, attracting unusual birds that you may not normally see in the region such as Spectacled Monarch. It’s the sort of place that anything could turn up. With permanent water there is an abundant of native fish, such as Sooty Grunter (Hephaestus fuliginosus), Freshwater Long Tom (Strongylura krefftii), a fish that looks like Garfish, and Rifle or Archer Fish (Toxotes Cuvier), a fish that’s famous for shooting powerful jets of water from its mouth to catch its prey. As a result of the abundance of fish, Cobbold Gorge has a sizable population of Freshwater Crocodile. To get there from Georgetown head 42 km south to Forsayth, then drive another 43 km to Cobbold. At the end of the road you’ll find excellent camping facilities and semi-self-contained ensuite cabins. From Cumberland Dam we headed to Karumba, on the way passing the famous Gulflander railway, a train that runs between Croydon and Normanton, or to put it another way (with no disrespect intended) between nowhere and nowhere. Unless you happen to live in nowhere, in which case it’s a great railway service! 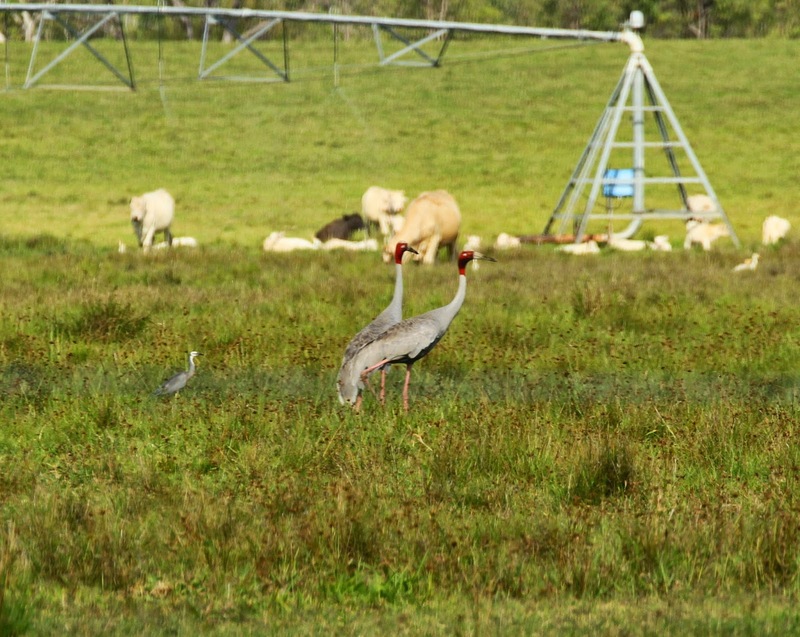 Along here we saw a pair of Sarus Crane with young as well as large numbers of Brolga. Both species breed in the gulf area during the wet season, before heading to the Atherton Tableland during the dry. Interestingly it was along this road that Australia’s first Sarus Crane were record in 1966. Some people suggest that they were present in Australia for much longer that, but were simply overlooked due to their similarity with Brolga, and were simply overlooked. Along this road we also saw Australian Bustard, Black-necked Stork, Glossy Ibis, and Australian Pratincole – the latter found in patches of grassland that had recently been burnt. Keep an eye open for Square-tailed Kite along this section of road. 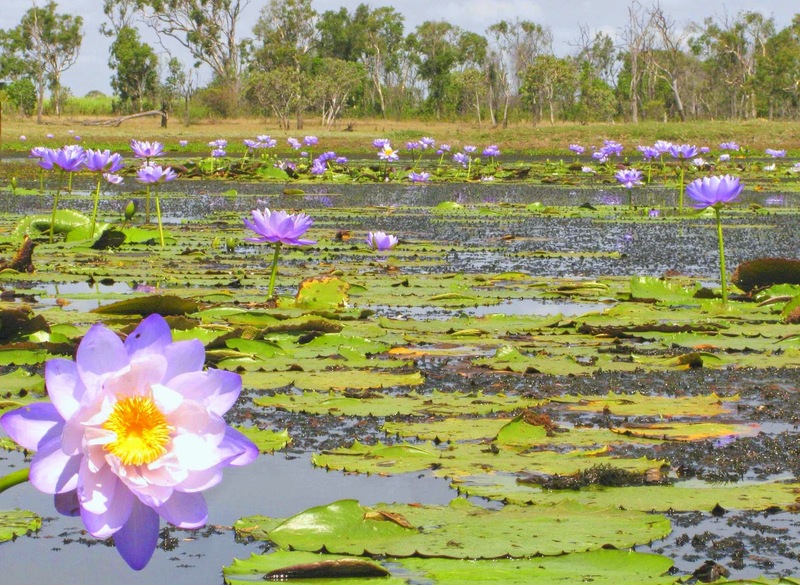 On the road between Karumba and Normanton you pass by the Mutton Hole Wetlands (9000 ha), a complex system of estuarine and freshwater wetlands. It’s extends ~30 km inland from Karumba. Part of the Southern Gulf Aggregation, during the wet season large areas of the wetland are covered by shallow water. Nationally important, it is one of the largest, most diverse and least fragmented natural wetland aggregations in Australia and, as a result, attracts vast numbers of water birds. The Mutton Hole Wetlands are a breeding, feeding, moulting and drought refuge for Sarus Crane, Brolga, and Plumed and Wandering Whistling Duck, Radjah Shelduck, Magpie Geese, Pied Heron and Black-necked Stork. Gouldian and Star Finch also occur at the wetland. Between August and April it’s visited by large numbers of migratory shorebirds, such as Marsh, Curlew, Sharp-tailed and Pectoral Sandpiper, Red and Great Knot, Red-necked Stint, and less common species such as Little Curlew, Oriental Pratincole and Oriental Plover. Surveys estimate that an average 122,000 shorebirds visit each summer, while 23,000 birds reside there each winter. Note that the road to Karumba is bitumen, so access should be available year round. However it’s always worth checking the current road conditions, particularly during December to February, when the water levels during the wet can get very high. 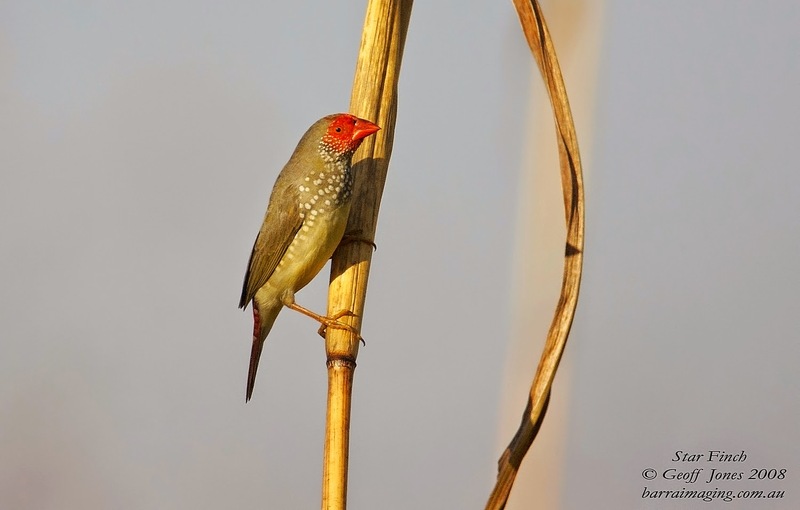 Star Finch, a spectacular looking finch, they’re found near Karumba. Geoff Jones. Karumba is surrounded by savannah grassland, meandering wetlands, savannah scrub and open woodlands, salt flats and coastal mangrove. Here’s a bit of a rundown of the plants in those habitats. Mangrove communities line the margins of the Norman River. These are predominantly Grey (or White) Mangrove (Avicennia marina ssp. eucalyptifolia), but also Red (or Long-style Stilt) Mangrove (Rhizophora stylosa), Rib-fruited Yellow Mangrove (Ceriops tagal), White-flowered Black Mangrove (Lumnitzera racemosa), Club Mangrove (Aegialitis annulata), Blind Your Eye Mangrove (Excoecaria agallocha), Cedar Mangrove (Xylocarpus moluccensis), Rib-fruited Orange Mangrove (Bruguiera exaristata), and Black (or River) Mangrove (Aegiceras corniculatum). That’s a lot of mangroves, and is the perfect habitat for mangrove bird species, such as Mangrove and White-breasted Whistler, Mangrove Robin, Red-headed Honeyeater, Yellow White-eye, to name a few. Seagrass beds (made up of two species, mainly Halodule pinifolia, but also a small percentage of H. ovalis) occur around the mouth of the Norman River i.e. near Alligator Point and the Elbow Banks. This is the spot you’ll find Dugong and, when the water level drops, shorebirds. Behind the coastal fringe of mangroves you find saline clay plains. Periodically inundated with water, these areas are predominately un-vegetated except for scattered low shrubs such as Shrubby Samphire (Tecticornia halocnemoides), Blue Bush (Chenopodium auricomum) and Kimberley Seablite (Suaeda arbusculoides). There are also patchy grassy swards of Marine (or Coastal Rat-tail) Couch (Sporobolus virginicus) and Rice Grass (Xerochhloa imberbis). It’s in these areas that you’ll find Golden-headed and Zitting Cisticola (the local ssp Normani) and Tawny Grassbird. Greg Oakley doing the daily bird count at Karumba Pub. The riparian woodlands around Karumba are dominated by broad and narrow leaved Melaleuca such as Silver-crowned Paperbark (Melaleuca fluviatilis), Purpurea Tea Tree (M. Trichostachya), Silver Cadjeput (M. argentea), Cadjeput (M. leucadendra), and the Broad-leaved Paperbark (M. viridiflora). While other species of tree include River Red Gum (Eucalyptus camaldulensis), River She-oak (Casuarina cunninghamiana), Pandanus Palm (Pandanus spiralis), Northern Swamp Mahogany (Lophostemon grandiflorus). There’s a range of Terminalia species such as Bendee (Terminalia bursarina), Yellowwood (T. Oblongata), and Durin or Pear Tree (T. platyphylla). A map of Karumba and its habitats. Firstly it is essential to do a boat trip with Ferryman River Cruises. Generally the boat leaves at 9:00 am (during the dry) from the boat ramp in the centre of town – although make sure you book the night before. From the boat we saw Red-headed Honeyeater (they like flowering mangroves), White-breasted and Mangrove Golden Whistler, Mangrove Robin, Mangrove Grey and Arafura Fantail, Broad-billed and Paperbark Flycatcher, Little Bronze-Cuckoo, and Mangrove Gerygone! Now that’s a bird list that rivals any of the great birding boat trips in Australia! Secondly, it’s important to take a walk in the mangroves and tidal salt flats north of the town – access near the intersection of Norman and Carron Street (-17.437961, 140.857318). White-breasted Whistler, Yellow White-eye, Mangrove Robin and Mangrove Gerygone inhabited the head-high mangrove clumps. As with most mangrove birds, ‘pishing’ is a very effective way to attract them. Other birds seen here included Broad-billed and Paperbark Flycatcher, Mangrove and Arafura Grey Fantail, Rufous Whistler, Little Bronze-Cuckoo and honeyeaters such as Rufous-throated, Red-headed and Yellow (western-most limit) Honeyeater. In the scattered salt flats grasslands between the mangroves we found Tawny Grassbird, Variegated Fairy-wren, Golden-headed and Zitting Cisticola (race Normani). Zitting Cisticola are often confused with their more common cousin Golden headed Cisticola – the former is distinguished by the lack of golden colouring on the head and rump, tends to be paler underneath, are more heavily streaked on top and, during breeding, have a heavy white edge to the tail feathers. Other places to look for Zitting Cisticola are the grasslands around the airport and along cemetery road. Thirdly: you have to have a few quiet beers at the Sunset Tavern in Karumba. 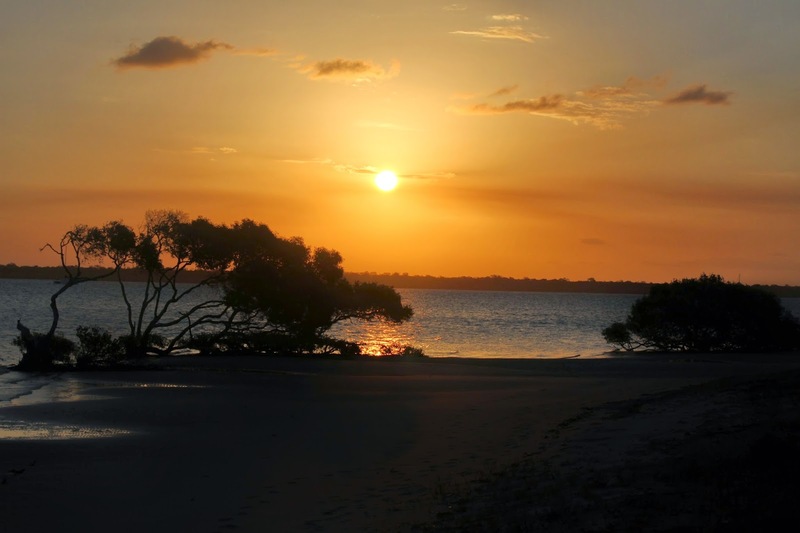 This is not only because it has a spectacular view the sun setting over the Arafura Sea, but it’s also located in front of mudflats that attracts large numbers of waders! So you can drink beer and play wader-watching pub-games at the same time i.e. spot the Broad-billed Sandpiper. Everybody is happy! During the dry season, 30 to 40 metres of mud-bank are be exposed along the Norman Rivers during low tide. Hence the large number of waders. Aside from Broad-billed Sandpiper, we also saw Lesser and Greater Sand Plover, Grey and Pacific Golden Plover, Common, Curlew and Sharp-tailed Sandpiper, Red-necked Stint, Eastern Curlew, Whimbrel and Grey-tailed Tattler. We also got the feeling that anything could turn up. Australia’s first Spoon-billed Sandpiper perhaps?! Note: an alternative to eating at the pub is to buy a Barra Burger (yep, a hamburger made with Barramundi) from the local fish and chip shop. They’re pretty damn good! Last, but definitely not least, it is important to search for Star Finch at small dam immediately to the north of the intersection of Karumba Point Road (Col Kitching Drive) and the Karumba Development Road (-17.457325,140.860299). Here, in a small bush beside the dam, Greg and I saw a mixed flock of over 100 finches. That flock included Star, Double-barred and Zebra Finch and Chestnut-breasted Mannikin. Now that’s a good mixed-finch flock! If you have time, other spots worth visiting in Karumba are the grasslands near the airport, the areas opposite the caravan park, the area opposite the Karumba Health Centre (on Walker Street) and, of course, what birding trip would be complete without a trip to the rubbish tip – another good place to look for Star Finch. 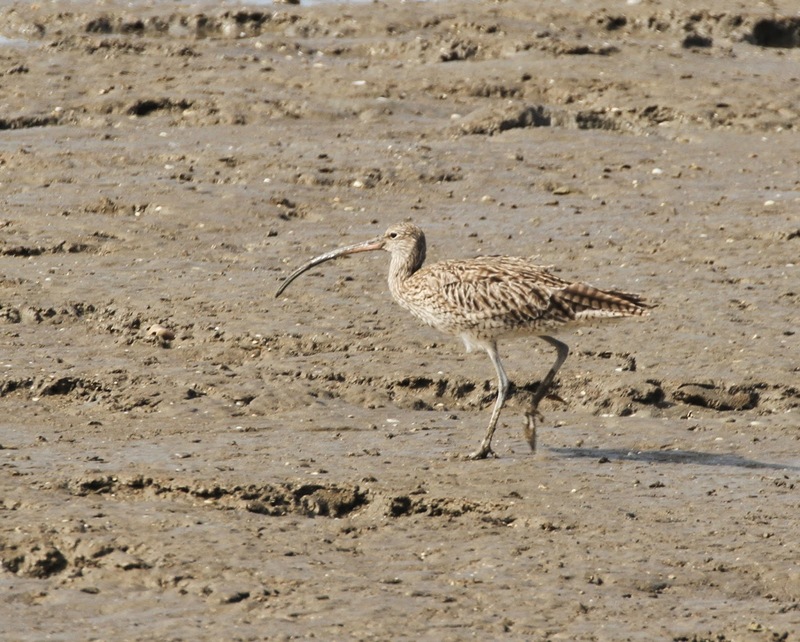 Eastern Curlew: at Karumba, because the mudflats are directly in front of the pub, it’s possible to do some serious wader-watching while having a quiet beer or two. We saw a Broad-billed Sandpiper this way! Just out of interest, mammals in the general area include macropods such as Red Kangaroo, Agile Wallaby, Common Wallaroo, and Northern Nail-tail Wallaby and there’s a chance of seeing the spectacular Spectacled Hare-wallaby. Other mammals include Short-beaked Echidna, Common Water Rat and Long-haired Rat. The coastal waters around Karumba is a good spot for sea turtles. Green, Loggerhead, Flatback, Hawksbill and Olive Ridley Turtle are all found in the Arafura Sea. While dolphins in the area include the spectacular Irrawaddy River Dolphin (a species that’s genetically closely related to the Killer Whale) as well as Indo-Pacific Humpback and Bottlenose Dolphin. Dugong are regularly seen in aerial surveys of the Norman River, and their feeding trails travel through local seagrass beds. Fruit bats include Black and Little Red Flying Fox and there are chance of Dagger-toothed Long-nosed Fruit Bat (now that’s a good name). There’s a nice selection of smaller bats, with a possibility of finding Large-footed Myotis, Hoary Wattled, Lesser Long-eared, Northern Broad-nosed, Beccari’s Free-tailed, Dusky Leaf-nosed, Little Broad-nosed, and Yellow-bellied Sheath-tailed Bat. Of course the saltwater tidal estuaries are the perfect habitat of Estuarine (Saltwater) Crocodile. Freshwater Crocodile are also found in the freshwater lagoons, such as the Mutton Hole Wetland, with substantial breeding area just upstream of Normanton. Other reptiles to look for include Merton’s Water Monitor, Black-headed Python (a snake eating python), both Eastern Brown and Western Brown Snake, as well as several species of Whip and File Snake. Karumba. Spectacular sunsets over the Arafura Sea.